If you’ve ever done a kitchen renovation before then you know how involved and lengthy that process can be. 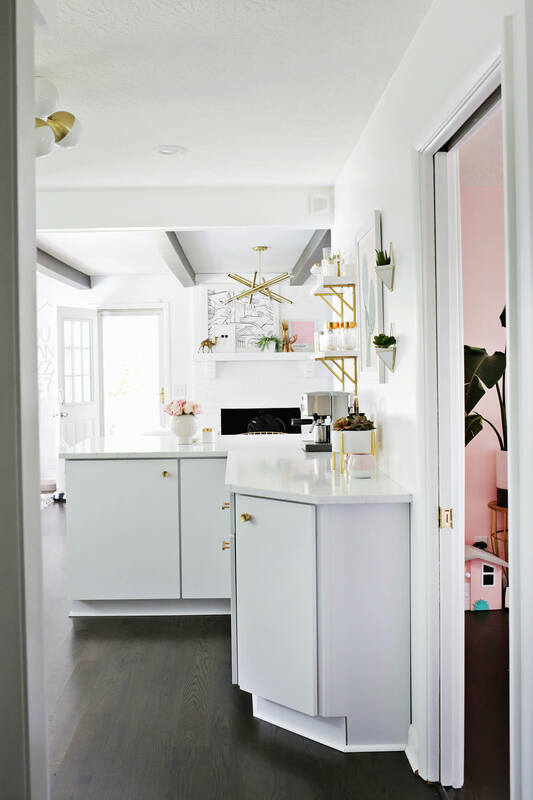 There are so many things to pick out (and research first if you are me) and since it can be one of the more expensive areas of a home to remodel, you really want to be sure that everything will look right so it’s a pretty nerve wracking project as well! 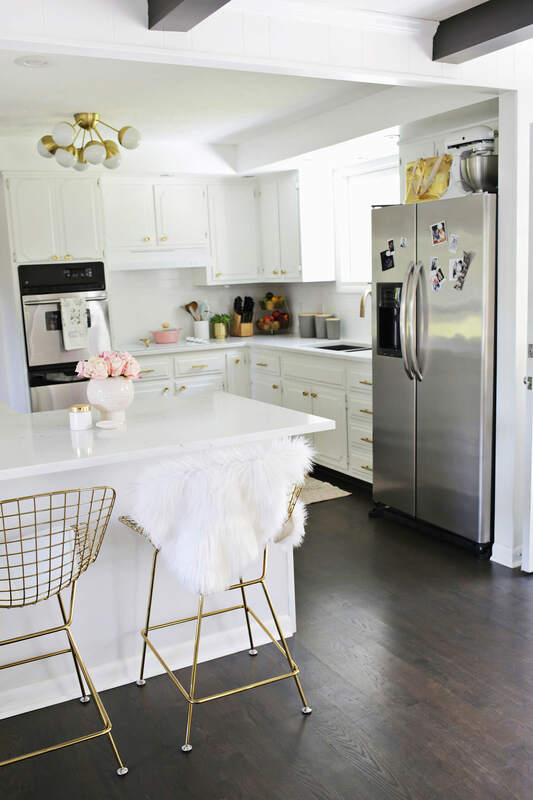 When we moved in to our home over two years ago the kitchen felt dark and small with wood cabinets, black granite, dated tile and there was hardly any counter space or food storage built into the setup. We knew we wanted to lighten the colors and add larger counters but it was a bit of a slow process so we’ve lived with the space in many different stages as we did one thing at a time. Want to see what it looked like before? As you can see it’s so much brighter overall even though we went with a darker floor. The light from that window can now bounce around the space instead of getting absorbed by the cabinets and countertop so it feels larger overall even though we added more cabinets opposite the sink for food storage. 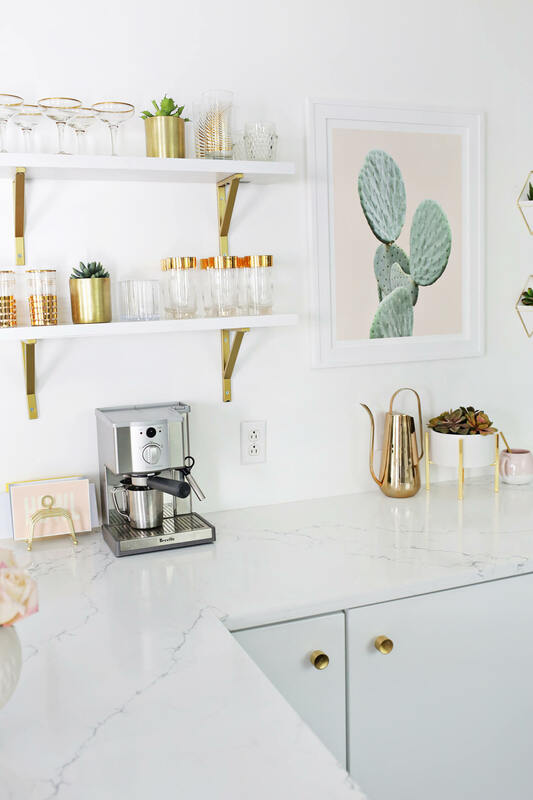 I do a lot of faux plants on shelves (especially when they are up high) and in wall planters so I don’t have to worry about water dripping down the walls if I overfill them (that beautiful gold leg planter actually has a faux plant as well already in it!). 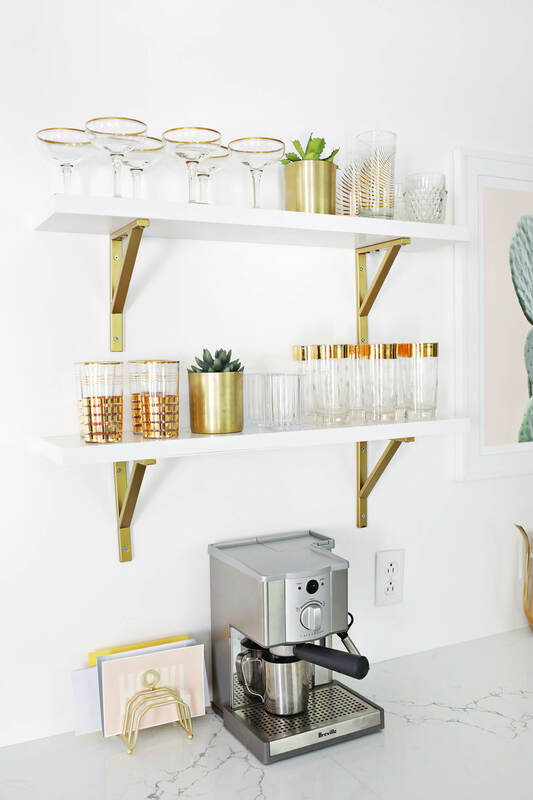 Those gold wall planters are perfect for adding a little green next to a print or a wallhanging and they come in a few sizes as well for grouping. 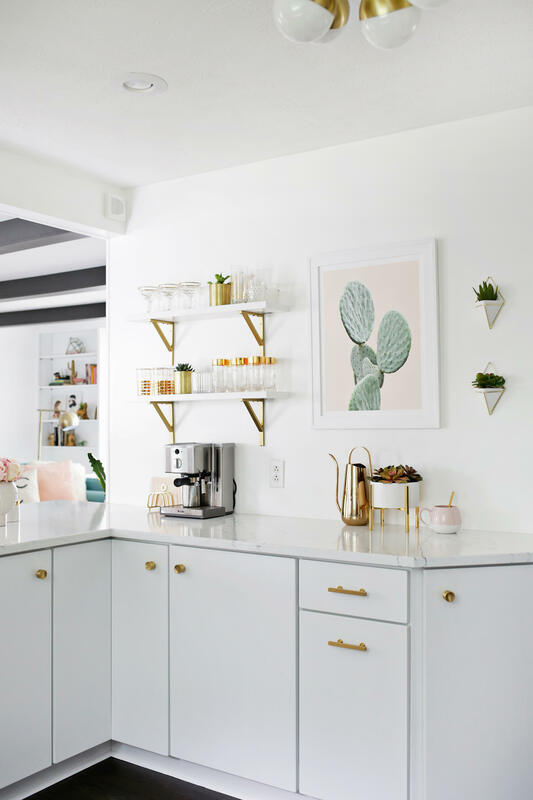 That cactus print is perfect for the space since it adds a pop of pink and green and stays in the “pastel California” vibe. I have a few watering cans spread throughout the house to remind me to water my plants but that brass one is probably my favorite. Adding some open shelving gave me some more space to display my vintage glassware but also got it away from a lower shelf in the dining room where little baby hands will soon be able to get to. Not looking forward to that stage! 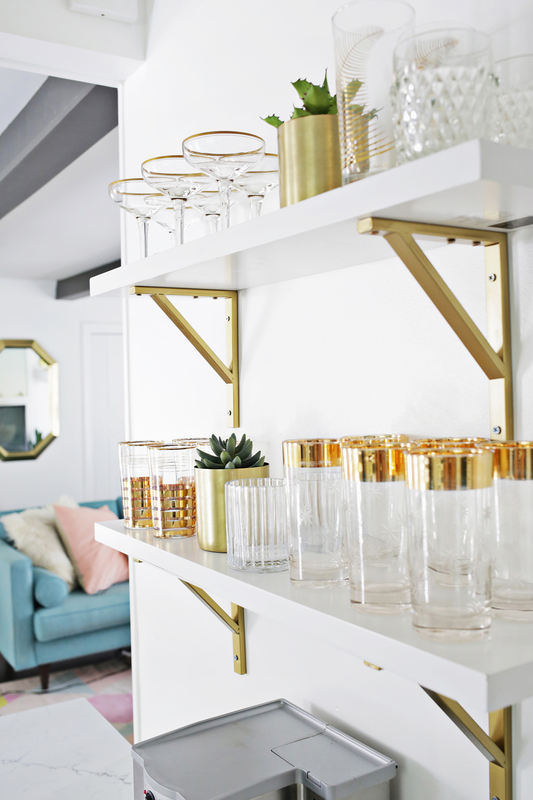 Those shelves are from Hobby Lobby but this one is a similar look. We painted the original cabinets white and added really simple new cabinets to compliment the original pieces. We used the same brass pulls and knobs on both to help tie the two areas together as well. 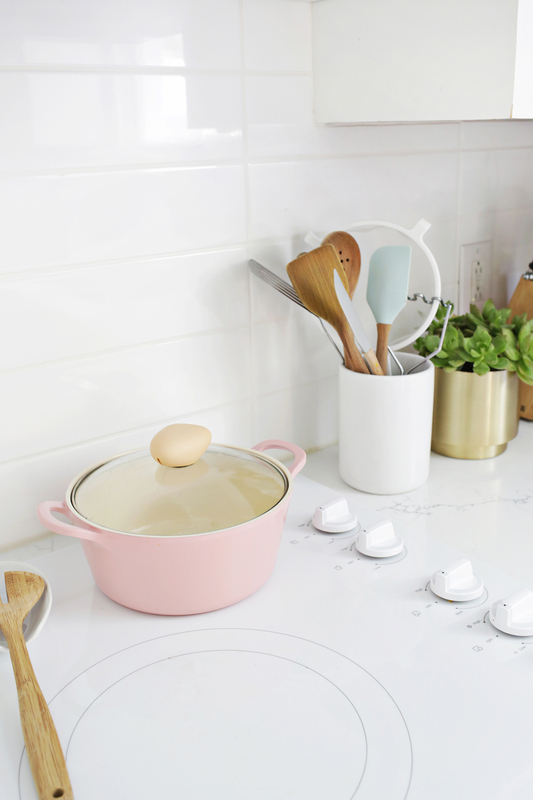 That pink pot is definitely my favorite piece of cookware—adorable! 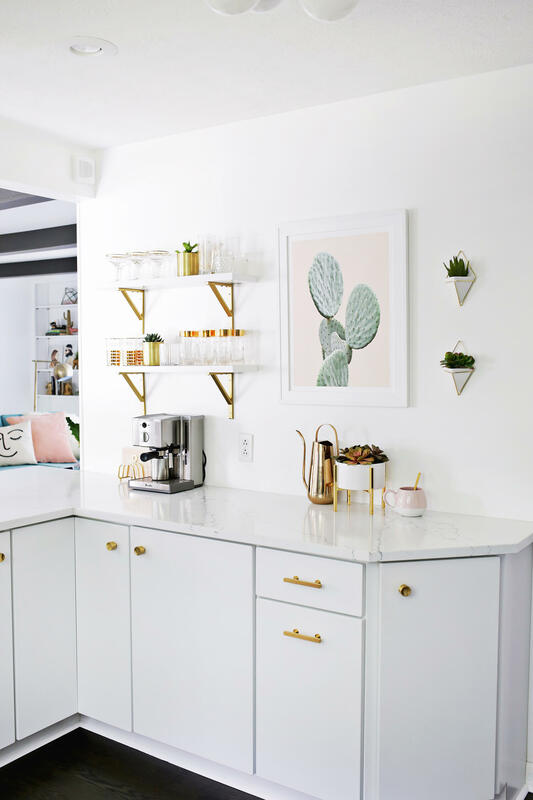 Gold looks so pretty against the white so I scatter gold planters around the kitchen wherever I can. 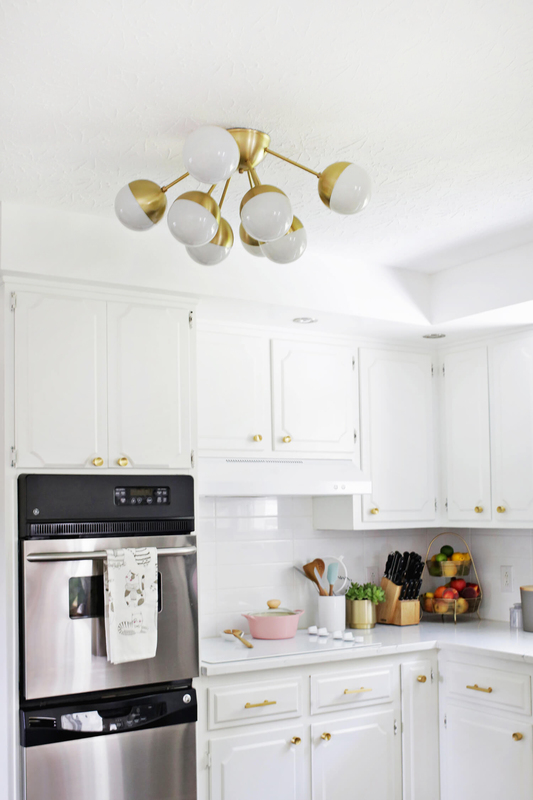 I wanted a light that had some personality without overwhelming the small space and this brass cluster chandelier is absolutely perfect for the job! I basically love everything in that shop and almost every light the in house is from them—so beautiful! Those white dot planters are all over my house—I love them! 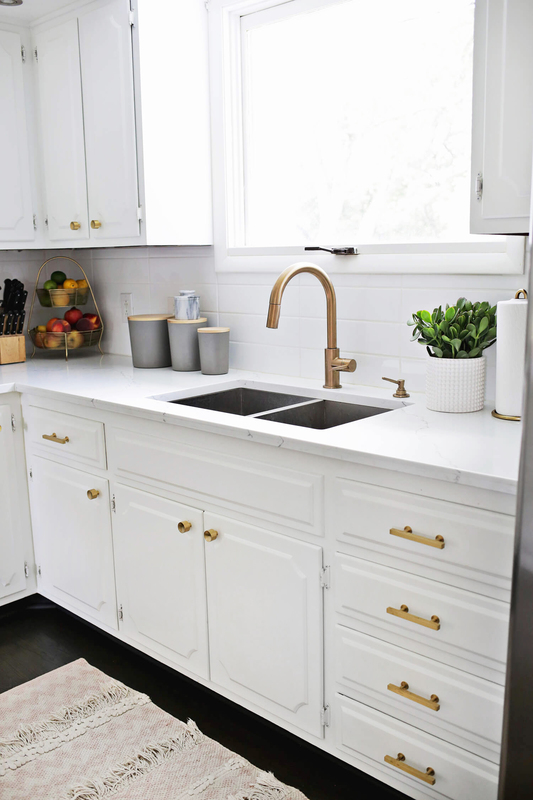 A friend of mine had that brass faucet and it was so pretty and easy to use (the faucet pulls down into a sprayer) that it made choosing a new faucet super a snap! Like designing any room I think the little details really make a difference so I tried to find items like that brass paper towel holder to be consistent with the overall feel of the space. 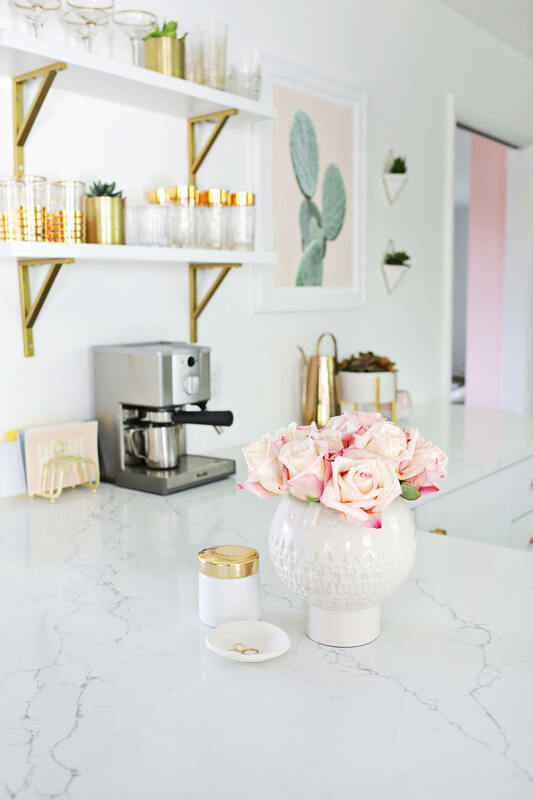 The countertop that we chose is Viscostone Venatino and I love that it looks like marble but it a lot less prone to staining and discoloration than the real thing. 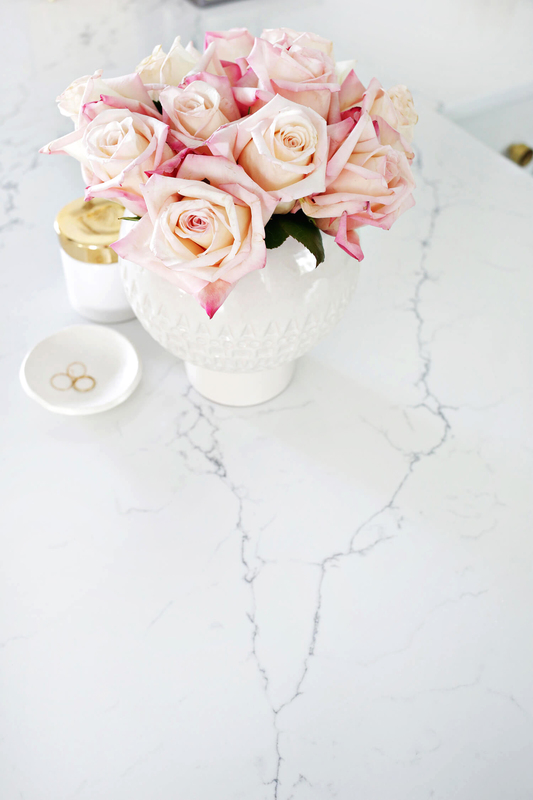 Marble is beautiful but can be a pain to live with, especially in a kitchen. I wanted some pretty seating for the counter area and those gold wire stools really pop against the white peninsula. 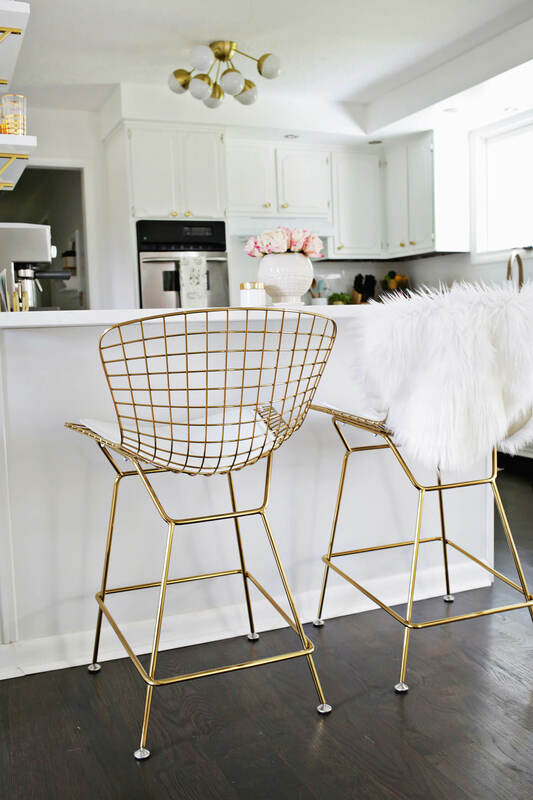 The wire on the back of the stool can dig into your back a bit when you sit on them but a furry faux sheepskin draped over the chair looks cute and solves that problem all in one! 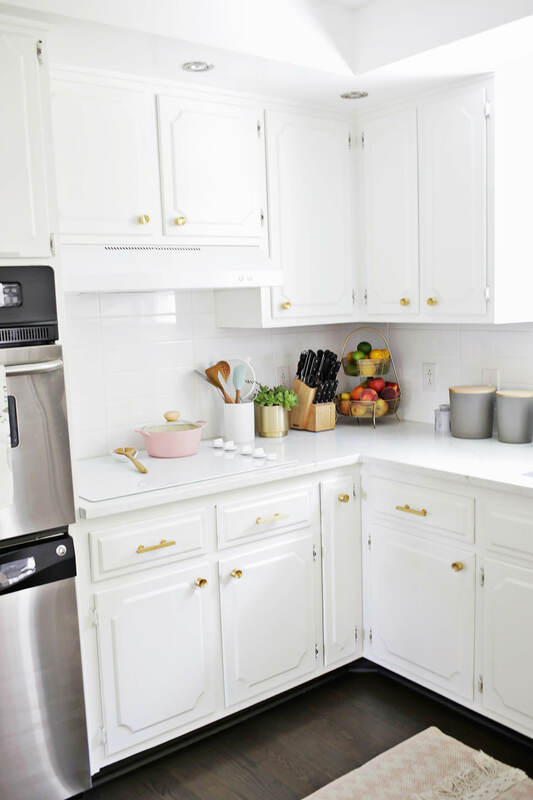 I double love that this kitchen is now both beautiful and has the functionality we’ve been desperately missing through the renovation stages. 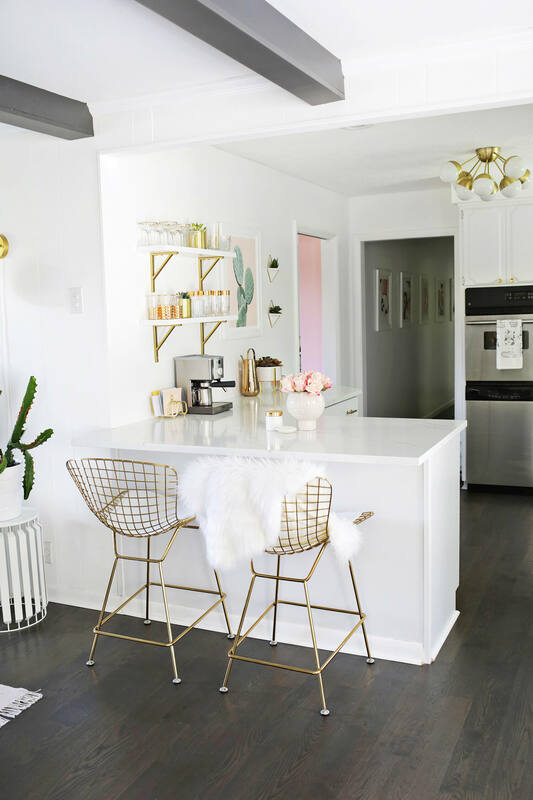 It’s such a happy place to make coffee in the morning and cook dinner in at night and it blends seamlessly with the rest of the house now as well. 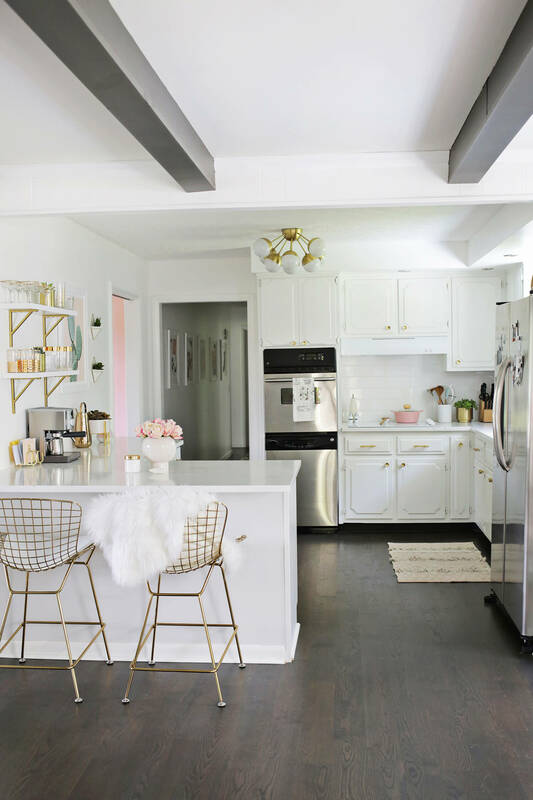 I don’t want to do another kitchen renovation any time soon but I will say that this one was totally worth it! Categories: Home Sweet Home | November 2, 2017 by thebandwifeblog. Fabulous job on your kitchen renovation! I’m getting r day to do mine and wondering if you had any tips/resources on painting cabinets (or any problems you encountered along the way? ), and what the price difference was between the Viscostone and marble? This is a good post on that subject by my friend Mandy! The updates are wonderful! 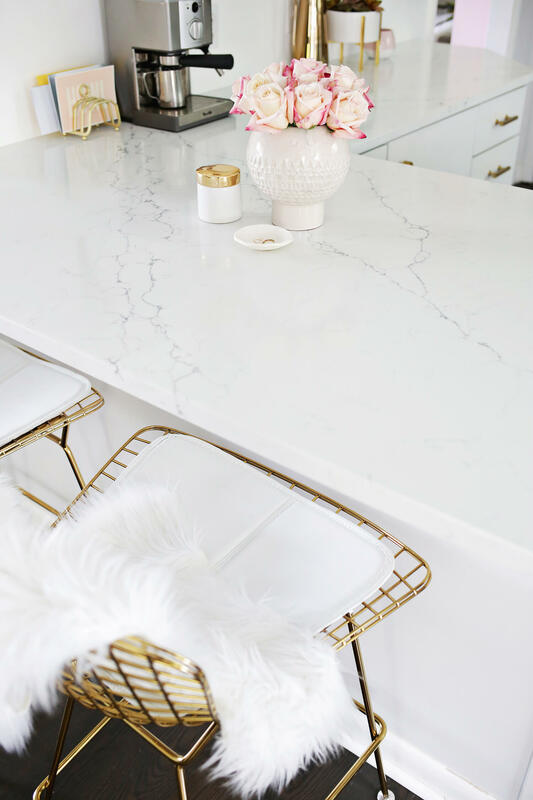 I love how the white brightens up the space and the gold accents make it feel more glam and everyday luxe. The coffee station and cups above are probably my favorite nook. Aw, thanks! Love seeing those pretty glasses everyday! It turned out so good! What paint color is on your walls? I love it! Just plain old untinted white, straight from the can! Love everything so much!! Where did you get the rug from, it’s adorable! I think it was TJ Maxx! Laura- did you guys do your cabinets yourselfs, or have someone else do them? Or do IKEA? We are about to start on our kitchen and I need a little corner piece at an angle that eases into the cabinets like you have! We got the new cabinets through Lowes!